I've driven down Main street many times but have not noticed Danny Woo Community Garden, the location of this month's Seattle Urban Sketch outing. 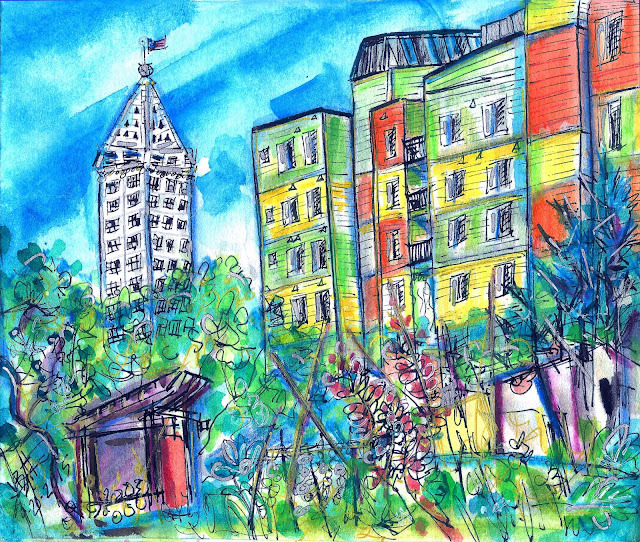 My first sight when scouting a good spot was this beautiful view of the Smith Tower and the colorful buildings that sort of reminded me of a recent visit to Burano Island in Italy. An enjoyable morning all around visiting with the other sketchers, watching the mix of people walking through the gardens, and thinking about many years ago about my first college internship at the top of the Smith Tower in the 1980's and the eclectic mix of urban-hippy the city of Seattle has become and the juxtaposition of the old, new, and transient.